Object We analyzed MMP-9 expression using mRNA and protein level determinations and explored the possibility that Matrix metalloproteinase-9 (MMP-9) is a potential biological marker of pituitary adenoma invasiveness and whether MMP-9 could be used to discriminate the extent of invasiveness among different hormonal subtypes, tumor sizes, growth characteristics, and primary versus recurrent tumors. Materials and methods 73 pituitary tumor specimens were snap frozen in liquid nitrogen immediately after surgical resection. RNA and protein were extracted. MMP-9 mRNA transcripts were analyzed by quantitative RT-PCR. MMP-9 protein activity was analyzed by gelatin zymography and validated by western blot analysis. Immunohistochemistry was performed to identify the presence and localization of MMP-9 in pituitary adenomas. Statistical differences between results were determined using Student’s t-test or one way ANOVA. Results Comparing different hormonal subtypes of noninvasive and invasive pituitary tumors, MMP-9 mRNA expression was significantly increased in the majority of invasive adenomas. Considering the protein levels, our data also showed a significant increase in MMP-9 activity in the majority of invasive adenomas and these differences were confirmed by western blot analysis and immunohistochemistry. In addition, consistent differences in MMP-9 expression levels were found according to tumor subtype, tumor size, tumor extension and primary versus redo-surgery. 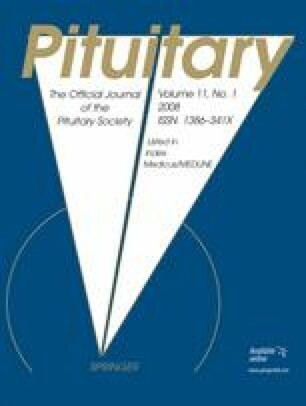 Conclusions MMP-9 expression can consistently distinguish invasive pituitary tumors from noninvasive pituitary tumors and would reflect the extent of invasiveness in pituitary tumors according to tumor subtype, size, tumor extension, primary and redo surgery, even at early stages of invasiveness. MMP-9 may be considered a potential biomarker to determine and predict the invasive nature of pituitary tumors. We are grateful to Dr. Yunde Bao (Department of Microbiology, University of Virginia Health System) for excellent technical support.